What if your fate had already been decided? What if your destiny was not your own? Joe (Ryan Smith) is a corporate underachiever who is approached by the mysterious Eliza (Christine Johnson), and told that his soul belongs to the devil because of an ancient treaty between Heaven and Hell. Joe must now perform odd jobs for his boss, with no understanding of their importance in the battle for mankind. When Joe finally sees the consequences of his actions, can he break away, or is redemption out of his reach? 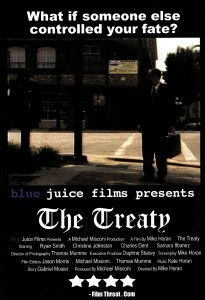 THE TREATY was the first project for Blue Juice Films. This super 16mm short was produced by Mike Misconi and written & directed by Mike Horan. To put it simply, Ryan Smith is a filmmaker’s dream. His comedic background, improvisation skills, and general good nature make him an excellent actor. Ryan had no trouble breathing life into the character of Joe. Since THE TREATY, Ryan has appeared in numerous Motion Pictures and Television shows and now resides in Los Angeles, CA. How do you play an agent of the devil? That was Christine’s challenge and she handled it with perfection. She established on-screen chemistry with Smith right away, and transformed Eliza into a beautiful but numbingly evil character. Christine has over 25 credits to her name and currently resides in Hollywood.